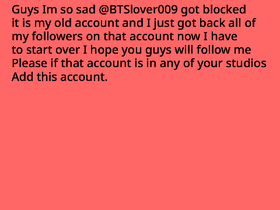 Hey it is @BTSlover009 I got blocked and I NEED ALL OF MY FOLLOWERS BACK SO PLEASE FOLLOW ME! IM A GIRL! I LOVE TO ROLE-PLAY. sexuality:Bisexual Im 12 years old. IM NOT SINGLE. Percy Jackson Rp and Find your Siblings!